Seeing as I’m suffering from writers block (see last post) I thought I’d post another picture. 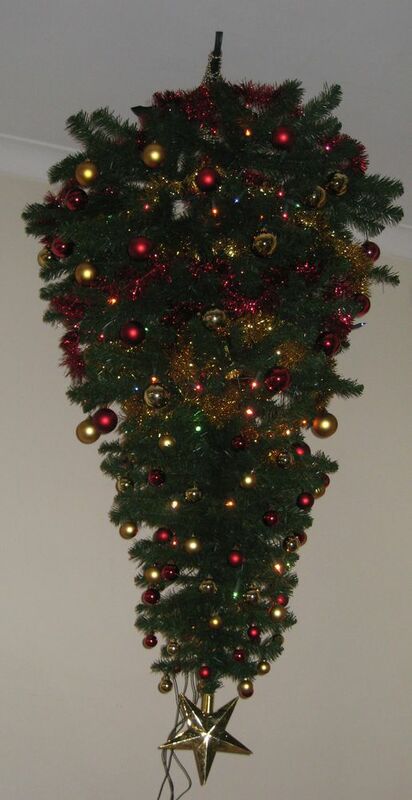 This is my Christmas Tree, which is hanging upside down from the ceiling. Why? Why not? I think I’m suffering from writers block. I’ve got 3 drafts backed up and I keep finding new things to write about, but I struggle to put into words what I want to say. I also seem to be lacking enthusiasm at the moment. 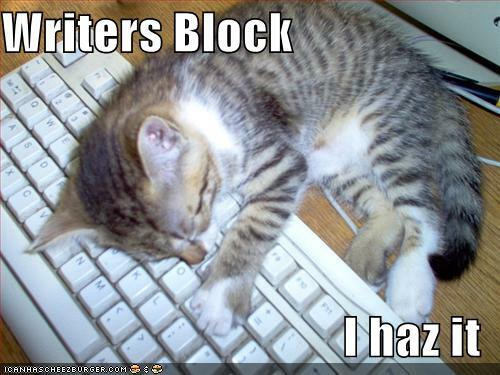 Have any of you other bloggers suffered from writers block and/or lack of enthusiasm? Hints and tips to get over this would be appreciated. One of those is Tracey Treasure. 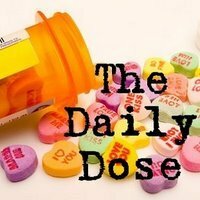 I haven’t been reading her blog all that long, but yesterday I decided to award Tracey the Daily Dose Award because hers is one of the blogs I regularly read and enjoy doing so. As I do with as many other of my favourite blogs as I can (if you are in my Atheist Blogroll in the sidebar consider yourself one of them). Well Tracey very kindly returned the compliment and awarded me the ‘Brilliante Weblog 2008 Award‘, I feel very honoured but don’t know if I really deserve it. I will proudly display this award in the sidebar. 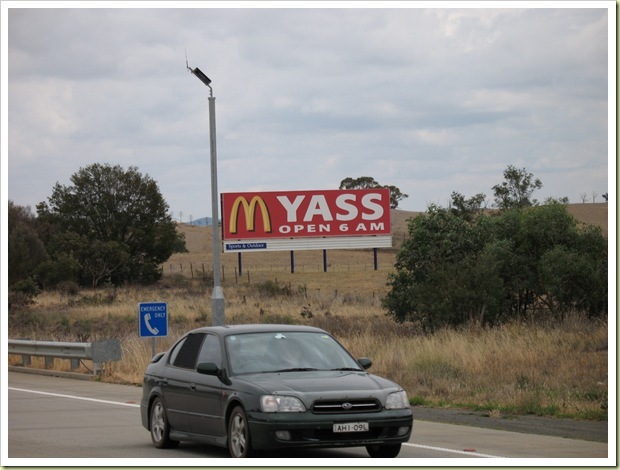 Thanks again to Tracey, you have made my day. The 7.30 report tonight discussed how the Senate is due to discuss private school funding. A vote is expected in the Senate late tonight on the Government’s controversial $28 billion assistance package for private schools. The Coalition is resisting key elements of the bill, including a national curriculum and public disclosure of the finances of non-government schools. The nation’s top private schools have condemned the public disclosure provisions accusing the Government of a hidden agenda to cut funding, but the Government strongly denies this. The transcript should be up tomorrow as well as the podcast if you missed it. We don’t want people to find out how rich we are, because the government might not give us as much tax-free taxpayers money. May write more once the transcript is up. … half the present courses being scrapped and possibly prohibit the teaching of intelligent design in Christian schools. By all accounts private schools get 2/3 of education funding but only teach 1/3 of all students, how the heck is that right? Last night the Opposition and Family First Senator Steve Fielding combined to remove the parts of the bill relating to a national curriculum. But the Government will not accept the amendments when the bill is returned to the Lower House. The government wants to have a national curriculum for all schools, but, somewhat unfortunately, the curriculum isn’t finalised yet. Hence the opposition and Senator (right-wing fundamentalist religious party) Fielding are saying they can’t pass the bill not knowing what’s going to be in the final draft of the national curriculum. On the face of it this would seem a somewhat reasonable stance, however (donning sceptical hat) I don’t think this is what it is really about. (donning educated guessing hat) I would assume the government’s national curriculum is going to be conservative and aimed to ensure students throughout Australia all get taught the same basic subject matter (reading, writing, arithmetic), I can’t imagine it’s going to have any outlandish subjects that have to be taught. So, even though the final draught hasn’t been released, what could possibly be worrying Senator Fielding and members of the opposition? May I hazard a guess, they are worried that the new national curriculum will ban teaching ID and dedicated religious subjects? Who knows? As Matt points out in the comments not all religious schools teach ID or Creationism, in fact some have very good biology subjects. However there are some schools that teach these subjects, or whilst teaching evolution also teach that the bible is the ultimate authority, hence confusing young impressionable minds. Have a look at my post A Christian Education for some further information on this topic. 1. Link to the person who tagged you (I did). 2. Post the rules on your blog (I did). 3. Write six random arbitrary things about yourself (see below). 4. Tag six people at the end of your post and link to them (see below – suckers). 5. Let each person know they’ve been tagged and leave a comment on their blog (doing now). 6. Let the tagger know when your entry is up. (back at you (((Billy)))). I’ve cut my head open twice in bed related incidents. I’ve appeared on TV at least twice. Once in an ABC current affairs program, and once broadcast live from an event at the Adelaide Festival Theatre. I wear a lot of Polo shirts, but none by Lacoste. I don’t know what that says about me? I’m tagging the following six people, however as this meme spreads it’s getting harder to find people who haven’t already been tagged. So if you have already been tagged, or done this meme, just drop a link in my comments. If you don’t have a blog and want to get involved just leave your 6 random things about yourself in my comments. I’ve rushed this out since I’ve finally realised I’d been tagged (hadn’t checked my own blog for 2 days!) to try and beat others to my taggees. Don’t forget to have a look at the other post today about abortion, censorship and the atheist bus advertising campaign.